Blepharoplasty is one of the most commonly performed plastic surgery procedures in the head and neck. When performed in carefully selected patients, upper and lower lid blepharoplasty can be a relatively simple and easily performed procedure. The surgeon's goal should be to obtain a natural-appearing, aesthetically pleasing result that betrays no sign of the operation. This is accomplished with little trouble in upper lid blepharoplasty because the natural upper eyelid crease naturally camouflages the operative incision line, and the long-term effects of scarring are usually minimal. In the operated lower lid, however, critical analysis of the long-term results often shows alterations in the position of the lid and resulting unnatural functional and cosmetic deformities. 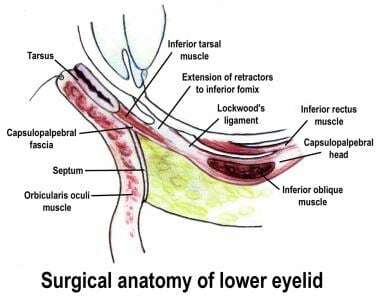 Careful patient evaluation, thorough understanding of lower eyelid anatomy (especially as it relates to the lateral canthus), and understanding of the various techniques available to address problems can prevent these undesirable surgical complications. As blepharoplasty has become more common, procedures have been developed to address complications of lower lid blepharoplasty and to prevent complications. The procedures discussed in the section on surgical therapy are listed in chronological order. The emphasis was initially on function. Newer procedures were developed not only to provide functioning lower eyelids but also to maximize aesthetic ideals for the lower lid. In addition to standard blepharoplasty, patients with poor lid tone and/or laxity of the lateral canthus may need adjunctive procedures in order to prevent postoperative scleral show or ectropion. The lateral canthal position relative to the medial canthus is also strongly related to aesthetics. Types of postblepharoplasty lower lid malposition include retraction (scleral show) and ectropion. Amount and character of skin: Evaluate the amount of excess skin as the patient looks upward. This stretches the skin and gives the surgeon an idea of how much redundant skin is present. If the amount of excess skin is only evaluated in a neutral or downward gaze, ectropion may be present after skin resection. Presence of pseudoherniated fat: Evaluate all 3 fat pads for pseudoherniation, which is also best evaluated in upward gaze. To differentiate fat herniation from edema, apply gentle pressure to the upper lid in upward gaze. Herniated fat becomes more pronounced with pressure, but no change in fullness occurs when lower lid edema is present. Position of the lower lid relative to the lower limbus: To measure for lower lid retraction, evaluate the lateral, central, and medial relationship of the lower lid to the inferior limbus while the patient is in neutral gaze. Ideally, no scleral show should be beneath the inferior limbus. In certain individuals, scleral show may be normal but should not be increased surgically. Margin reflex distance-2 (MRD2): This is an objective measurement that may be taken by shining a light in the patient's eyes when they are at the same level as the examiner's eyes. The distance from the corneal light reflex to the lower lid is normally 5.5 mm but will be increased in patients with ectropion. The difference between the normal MRD2 and the measured MRD2 may give an indication of how much skin is needed to correct an ectropion caused by anterior lamella deficiency. Presence of hypertrophied orbicularis muscle: Hypertrophied muscle may manifest as a noticeable band in the lower lid. Tone of the lid: Assess lid tone with the snap test and by evaluating the lateral canthus. Snap test: Pull the lower eyelid downward and assess how long it takes to return to a normal position. A return of less than 1 second (without blinking) is normal. Distraction test: If the lower lid may be pulled more than 7 mm from the globe, then laxity may be present. Pinch test: Gently pull the lateral canthus medially. Minimal movement demonstrates a normal lid. When there is laxity, the canthus can be moved more than 2 mm or to the lateral limbus. Negative vector: The relationship of the cornea to the inferior orbital rim is examined from the lateral view. In most patients, a line drawn from the cornea touches the inferior orbital rim. In patients with a negative vector, the inferior orbital rim falls posterior to this line. These patients may be at risk for lower lid malposition (increase in scleral show), but they may also be at risk of a hollowed-out appearance after blepharoplasty if fat repositioning is not performed as part of their procedure. Always address laxity of the lower eyelid to prevent complications in blepharoplasty. The lower eyelid is commonly described as a series of layers. The anterior lamella is composed of the outer skin and orbicularis oculi muscle. The middle lamella consists of the orbital septum. The posterior lamella consists of the tarsus, the lower lid retractors, and the conjunctiva. The lateral canthus is the tendinous insertion of the orbicularis oculi muscle into the lateral orbital rim. The canthus is composed of an inferior retinaculum that is in continuity with the lower lid and an upper retinaculum that is in continuity with the upper lid. The upper and lower lid fuse to form a common band that inserts into the Whitnall tubercle inside the lateral orbital rim. Aesthetically appealing eyes have an almond shape. Because the shape of the upper lid is relatively constant, the shape of the lower lid is the primary determinant of the overall shape of the eye. Ideally, the lower lid margin should abut the inferior limbus of the iris. The lateral canthus is approximately 2 mm higher than the medial canthus, so the lower lid elevates slightly over the entire distance of the palpebral fissure. This elevation, however, is not a strictly linear phenomenon. The medial portion of the lid is relatively horizontal with only a slight upward curvature. The lid curves downward, slightly lateral to the limbus, to invoke an open look before curving upward from this point to the lateral canthus. Medical problems such as glaucoma, myasthenia gravis, active thyroid disease, or unilateral blindness may be contraindications. Dry eyes may be worsened by blepharoplasty. A Schirmer test can identify these patients preoperatively. An abnormal Schirmer test result alone may not be significant, but when combined with a tear film breakup time, it signals the potential for postoperative dry eye syndrome. Patients with lower lid laxity have a relative contraindication to blepharoplasty performed without some adjunctive procedure to prevent postoperative ectropion or eyelid malposition. Big eyes equal big trouble. Exophthalmos may be the result of a medical condition, such as thyroid disease, but also occurs as a normal variant. Patients with bulging eyes often have a pronounced negative vector, and lower lid surgery may cause them to have a hollowed-out postoperative appearance or functional problems (eg, scleral show, ectropion) related to eyelid malposition. Consider fat repositioning or mobilization in these patients. Lower lid tightening or repositioning may result in an increase in eyelid malposition in the patient with exophthalmos. To understand this, it is helpful to think of a belt being pulled tightly over a large pannus. As the belt is tightened, the pannus must go up or down to accommodate the tightening. If the eyelid is shortened and tightened in a patient with exophthalmos, the result is usually more exposure of the eye, leading to scleral show or ectropion. Frank exophthalmos must be diagnosed, and the etiology must be determined, because the appearance of these patients is often worsened by any type of blepharoplasty or lid tightening procedure. Rebowe RE, Runyan C. Blepharoplasty. 2018 Jan. [Medline]. [Full Text]. Murri M, Hamill EB, Hauck MJ, Marx DP. An Update on Lower Lid Blepharoplasty. Semin Plast Surg. 2017 Feb. 31 (1):46-50. [Medline]. [Full Text]. Scawn R, Gore S, Joshi N. Blepharoplasty Basics for the Dermatologist. J Cutan Aesthet Surg. 2016 Apr-Jun. 9 (2):80-4. [Medline]. [Full Text]. Maffi TR, Chang S, Friedland JA. TRADITIONAL LOWER BLEPHAROPLASTY: IS ADDITIONAL SUPPORT NECESSARY? A 30 YEAR REVIEW. Plast Reconstr Surg. 2011 Mar 10. [Medline]. Flowers RS. Canthopexy as a routine blepharoplasty component. Clin Plast Surg. 1993 Apr. 20(2):351-65. [Medline]. Miller TR. Long-Term 3-Dimensional Volume Assessment After Fat Repositioning Lower Blepharoplasty. JAMA Facial Plast Surg. 2016 Feb 4. [Medline]. Miranda SG, Codner MA. Micro Free Orbital Fat Grafts to the Tear Trough Deformity during Lower Blepharoplasty. Plast Reconstr Surg. 2017 Jun. 139 (6):1335-43. [Medline]. Griffin G, Azizzadeh B, Massry GG. New insights into physical findings associated with postblepharoplasty lower eyelid retraction. Aesthet Surg J. 2014 Sep. 34(7):995-1004. [Medline].